In the past 13 months, California has seen two of its largest wildfires in terms of acreage, two of its most destructive blazes in terms of structures lost, and the deadliest fire on record, which has claimed at least 88 lives. California is battling around 17 substantial fires including the biggest in the state’s written history. Since the beginning of California’s fire season, there have been multiple fires, and compared to the quantity of land burnt over a similar period a year ago, the state has employed more fire-fighting efforts than ever. The Northern California city of Paradise is gone—the Camp Fire, by far the deadliest and most destructive wildfire in state history, has reduced homes to ashes. It conjures images of a tsunami of flames tearing through the town, destroying everything in its path. Over the past few decades, cities in California have crept closer and closer to fire-prone forests. Codes went lax, and many homes were still getting built with wooden shingles. There were more than 158 individuals still missing in the Butte County fire zones, and experts were attempting to track them down. Authorities requested that occupants go to the Butte County Sheriff’s Department’s site to check the missing persons’ list to ensure they are not on it. The numbers, however, do not even begin to describe the challenge and intricacies of fighting these fires. Such struggles include the temperatures of the land that rescue teams must face due to the fires. Flames are moving more quickly than anybody has ever observed, and boundaries that in years past contained flames — bulldozer lines, highways, streams — are no match for the fires. As the days go on, the numbers have climbed, as more sections of land are consumed and more workforce hurry to the fires. Part of the problem is climate change. Autumn has grown increasingly dry in California, which is poorly timed with hot, dry seasonal winds that tear in from the east, further desiccating vegetation and turbo-charging wildfires. Reporters later asked President Trump if seeing what survived of the Northern California town and strolling among the ashes made him reconsider his sentiment on climate change — that it is a deception, counterfeit news, or essentially nonexistent. “No,” Trump replied. Rather, he placed blame on California forest management. More than 30 homes in the gated Ventura County community were lost. 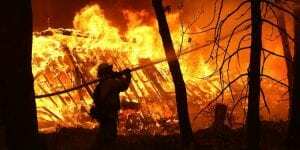 Some people were protected by both county firefighters and private crews who are covered by their homeowner’s insurance policy. With California encountering two years of uncommonly fierce blazes, the state has been left with an excess of 20,000 homes obliterated and hundreds of thousands dead. Because fires have become such a constant issue, the private firefighting business is booming. These brigades work freely from area firefighters; their job is to protect specific homes under contract with insurance agencies. Others are trying to raise funds, such as Stevie Wonder, who is having a benefit concert for California fire victims. Others, like Miley Cyrus and Liam Hemsworth, have donated to help those affected by the fires. Although Californian rescue teams and government officials are working as quickly as they can to combat with these natural disasters, time will only tell how quickly the environment will be able to recover.